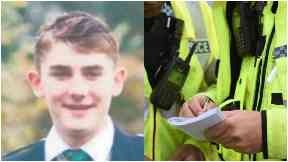 Liam Smith, 16, was last spotted on Queens Road in Aberdeen at Saturday lunchtime. Missing: Liam was last seen on Saturday. Concern is growing for a missing teenager who was last seen in Aberdeen. Police have been unable to trace Liam Smith, 16, who was last spotted on Queens Road at around 12pm on Saturday. He was wearing a dark top, blue jeans, Nike Air Max trainers and was carrying a North Face backpack. A Police Scotland spokeswoman told STV News on Monday that the search is continuing for the teenager following a public appeal at the weekend.